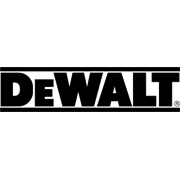 A new concept in DeWALT sawing - the plunge saw offers new levels of speed of setup, accuracy of cut and quality of finish. Parallel plunge allows the user to maintain a smooth and constant hand position while cutting. A 42 tooth blade gives a fine and accurate finish with very little breakout in laminates. 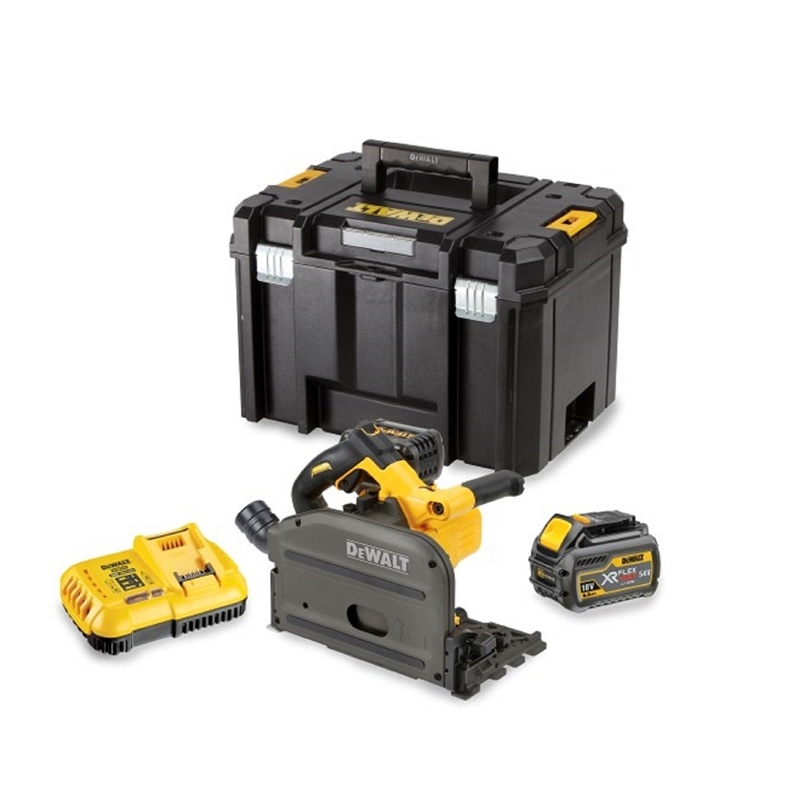 Central to this cutting system is the DeWALT track, which combines with other tools in the DeWALT range, with a full range of attachments and with dust management system to provide a complete job site solution. 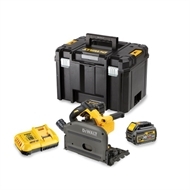 The DeWALT DCS520T2-XE plunge saw comes as standard with a 1.5m rail, XR Fast Charger, 2x XR FlexVolt Battery Packs and a TSTAK kit box. Rail adjustment allows the saw to be adjusted accurately to the rail. The anti kickback function stops the saw from moving backwards along the rail and helps stop the saw from climbing out of the work piece when making plunge cuts. Variable speed allows the correct speed to be set for different types of materials. The enclosed guard gives a 90% dust extraction capability. 54V XR FlexVolt giving the power of the cord - without the cord.